The Funeral Record books often have a great deal more information, including: residence, veteran status, occupation, employer, funeral date, clergyman and place of service, cause of death, cemetery information and newspaper obituary/death notices. Anyone can search this index. 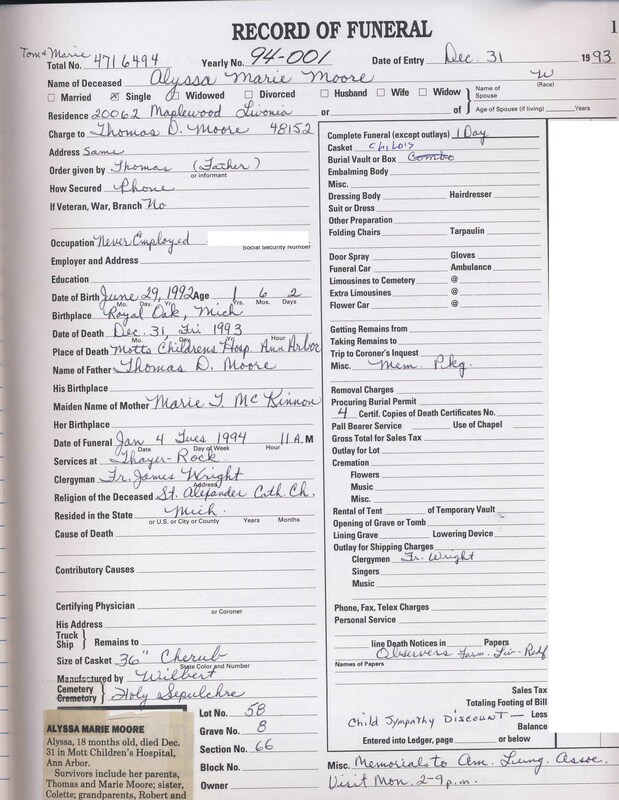 If you find a possible person or persons you are interested in, you can request a copy of the actual Funeral Record (with cost information and Social Security number redacted). (You may also contact Thayer-Rock Funeral Home directly at 248-474-4131.) Click here for a sample of the actual record. If you are a Farmington Society member, your request is free. Click here for instructions on how to request a copy of the records. If you are not a Society member, the cost for a copy of the actual record will be $5.00 per record. If you have four or more requests, we encourage you to join the Society for the $20.00 membership fee and you can then get additional records for free. With the membership fee, you are entitled to receive a monthly newsletter. Click here if you wish to purchase the printouts one at a time. Click here is you wish to join the Farmington Genealogical Society. When searched, if the "Surname" listing displays a double red astersik (**), then the match was found in one of the relative names (father, mother, or spouse) which are displayed on the detail record. The search is not complex like searches in Ancestry, Family Search, etc. It only does an exact search. Try using variations on name spellings for more successful searches.